Definition at line 75 of file llfloaterchat.h. Definition at line 104 of file llfloaterchat.cpp. References LLUICtrlFactory::buildFloater(), LLPanel::childSetAction(), LLPanel::childSetCommitCallback(), LLPanel::childSetVisible(), createChatPanel(), createSpeakersPanel(), FALSE, LLPanel::getFactoryMap(), gUICtrlFactory, LLPanel::mFactoryMap, NULL, onClickToggleActiveSpeakers(), onClickToggleShowMute(), and LLPanel::setDefaultBtn(). Definition at line 121 of file llfloaterchat.cpp. Definition at line 550 of file llfloaterchat.cpp. References addChatHistory(), LLConsole::addLine(), AddNewChatToLCD(), AddNewIMToLCD(), CHAT_MSG_SIZE, CHAT_SOURCE_AGENT, CHAT_TYPE_DEBUG_MSG, gConsole, get_text_color(), LLControlGroup::getBOOL(), gSavedPerAccountSettings, gSavedSettings, INSTANT_MSG_COLOR, INSTANT_MSG_SIZE, log_chat_text(), LLChat::mChatType, LLChat::mFromIM, LLChat::mMuted, LLChat::mSourceType, LLChat::mText, and size. Referenced by check_offer_throttle(), handle_selected_texture_info(), notify_cautioned_script_question(), LLViewerChatterBoxInvitation::post(), process_chat_from_simulator(), process_improved_im(), LLFloaterCompileQueue::scriptArrived(), and trigger_hippo_bug(). Definition at line 396 of file llfloaterchat.cpp. References add_timestamped_line(), LLFloaterScriptDebug::addScriptLine(), CHAT_SOURCE_OBJECT, CHAT_TYPE_DEBUG_MSG, f, get_text_color(), LLControlGroup::getBOOL(), getChatPosition(), LLUICtrlFactory::getCheckBoxByName(), LLPanel::getChildByName(), LLUIInstanceMgr< LLFloaterChat, LLFloaterChat >::getInstance(), LLColor4::grey, gSavedPerAccountSettings, gSavedSettings, LLUUID::isNull(), lerp(), log_chat_text(), LLChat::mChatType, LLChat::mFromID, LLChat::mFromIM, LLChat::mFromName, LLChat::mMuted, LLChat::mSourceType, LLChat::mText, LLTextEditor::setParseHTML(), LLSpeaker::SPEAKER_OBJECT, LLSpeaker::STATUS_NOT_IN_CHANNEL, and TRUE. 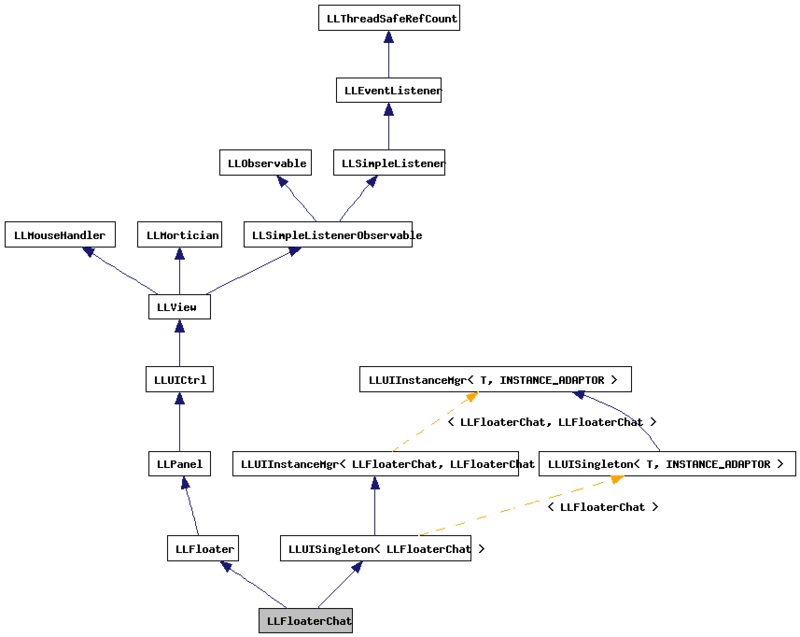 Referenced by addChat(), LLIMMgr::addSystemMessage(), cache_name_callback(), chatFromLogFile(), inventory_offer_callback(), LLNotifyBox::LLNotifyBox(), process_chat_from_simulator(), and processObjectPropertiesFamily(). Definition at line 363 of file llfloaterchat.cpp. References addChatHistory(), llendl, llwarns, LLChat::mFromName, and mLookupQueue. Definition at line 664 of file llfloaterchat.cpp. References addChatHistory(), FALSE, and LLChat::mText. Definition at line 679 of file llfloaterchat.cpp. Definition at line 673 of file llfloaterchat.cpp. Definition at line 133 of file llfloaterchat.cpp. References LLPanel::childIsVisible(), LLPanel::childSetValue(), LLFloater::draw(), LLPanel::getChildByName(), mPanel, LLChatBar::refresh(), LLPanelActiveSpeakers::refreshSpeakers(), and TRUE. Definition at line 231 of file llfloaterchat.cpp. References cache_name_callback(), DB_FIRST_NAME_BUF_SIZE, FALSE, gCacheName, LLCacheName::get(), LLCacheName::getName(), LLUUID::isNull(), mLookupQueue, and S32. Referenced by getChatAvatar(), and processObjectPropertiesFamily(). Definition at line 204 of file llfloaterchat.cpp. References CHAT_SOURCE_AGENT, getAvatarName(), LLUUID::isNull(), LLChat::mFromID, LLChat::mFromIM, LLChat::mFromName, mObjectOwners, LLChat::mSourceHost, LLChat::mSourceType, and requestObjectOwner(). Definition at line 386 of file llfloaterchat.cpp. References LLRegionNameCache::get(), gRegionNameCache, LLUUID::isNull(), llformat(), LLChat::mPosAgent, LLChat::mRegionID, LLVector3::mV, VX, VY, and VZ. Reimplemented from LLUIInstanceMgr< LLFloaterChat, LLFloaterChat >. Definition at line 686 of file llfloaterchat.cpp. References LLFloater::getHost(), LLUIInstanceMgr< LLFloaterChat, LLFloaterChat >::getInstance(), LLUIInstanceMgr< T, INSTANCE_ADAPTOR >::hideInstance(), and LLUIInstanceMgr< LLFloaterChatterBox, LLFloaterChatterBox >::hideInstance(). Definition at line 658 of file llfloaterchat.cpp. References chatFromLogFile(), LLUIInstanceMgr< LLFloaterChat, LLFloaterChat >::getInstance(), and LLLogChat::loadHistory(). Definition at line 499 of file llfloaterchat.cpp. References LLMuteList::add(), LLUICtrlFactory::getComboBoxByName(), LLComboBox::getCurrentID(), LLComboBox::getSimple(), gFloaterMute, gMuteListp, LLMute::setFromDisplayName(), and LLFloaterMute::show(). Definition at line 701 of file llfloaterchat.cpp. Definition at line 521 of file llfloaterchat.cpp. References FALSE, LLCheckBoxCtrl::get(), LLUICtrlFactory::getCheckBoxByName(), LLPanel::getChildByName(), LLTextEditor::setCursorAndScrollToEnd(), LLView::setVisible(), and TRUE. Definition at line 162 of file llfloaterchat.cpp. References FALSE, gSavedSettings, LLControlGroup::setBOOL(), and setVisible(). Definition at line 171 of file llfloaterchat.cpp. References gConsole, LLView::onVisibilityChange(), and LLView::setVisible(). Definition at line 149 of file llfloaterchat.cpp. References LLPanel::getChildByName(), LLUICtrlFactory::getComboBoxByName(), LLUICtrlFactory::getPanelByName(), mPanel, LLChatBar::setGestureCombo(), and TRUE. Definition at line 322 of file llfloaterchat.cpp. References _PREHASH_ObjectData, _PREHASH_ObjectID, _PREHASH_OwnerID, _PREHASH_RequestFlags, addChatHistory(), getAvatarName(), LLUIInstanceMgr< LLFloaterChat, LLFloaterChat >::getInstance(), LLMessageSystem::getU32Fast(), LLMessageSystem::getUUIDFast(), llendl, llinfos, mObjectOwners, and LLUUID::null. Definition at line 288 of file llfloaterchat.cpp. References _PREHASH_AgentData, _PREHASH_AgentID, _PREHASH_ObjectData, _PREHASH_ObjectID, _PREHASH_RequestFlags, _PREHASH_RequestObjectPropertiesFamily, _PREHASH_SessionID, LLMessageSystem::addU32Fast(), LLMessageSystem::addUUIDFast(), gAgent, LLAgent::getID(), LLAgent::getSessionID(), gMessageSystem, LLUUID::isNull(), llendl, llinfos, LLMessageSystem::newMessageFast(), LLMessageSystem::nextBlockFast(), and LLMessageSystem::sendReliable(). Definition at line 488 of file llfloaterchat.cpp. References LLPanel::getChildByName(), LLUIInstanceMgr< LLFloaterChat, LLFloaterChat >::getInstance(), LLTextEditor::setCursorAndScrollToEnd(), and TRUE. Definition at line 126 of file llfloaterchat.cpp. Definition at line 115 of file llfloaterchat.h. Referenced by cache_name_callback(), and getAvatarName(). Definition at line 116 of file llfloaterchat.h. Definition at line 114 of file llfloaterchat.h.